3 Floors. Presented by Frite Nite, Surefire, Red Bull Music Academy, Cariboo Brewing. Produced by W2. Halloween weekend we invite you to revel in our massive Frite Nite Vancouver at W2. 10+ artists perform throughout 3 floors of forward-thinking bass music, including our two headliners – Salva from LA and Clicks & Whistles from Charlotte, NC. Salva, a 2011 Red Bull Music Academy alum, owns & operates the Frite Nite label/brand, and released one of this year’s hottest tracks – his & RL Grime’s remix of Kanye West’s “Mercy,” a precursor, or at least catalyst, of the “trap” sound that has come to define 2012’s largest musical trend. The latter are a pair of producers on the rise, with releases forthcoming on Distal’s Embassy Recordings and Kastle’s Symbol Recordings, and will be making their Vancouver debut on this night. 4/4 stylings will be fully represented on the 2nd level, including local producer Eames, who also turned in a Frite Nite podcast earlier this year. $15 early bird | $20 advance | Group of friends 5 for only $75. Get tix for your crew. Discount entry for SFSS members attending SFU pre-event who enter by 8pm. This special 3-level event is a fundraiser for W2 Community Media Arts Society. A versatile solo producer, crowd riling DJ, owner of the revered Frite Nite label and key figure in the Friends of Friends collective, Paul Salva knows how to control a room. After dropping one of 2012’s biggest tracks, a collaborative remix of Kanye West’s “Mercy” that not only reached #1 on Soundcloud, but received spins on Power 106 FM (LA), Power 105 FM (NYC), and Shade45XM, Salva’s work promotes complexity through a synthesis of contrasting styles, showcasing dips into house motifs, grooves in smooth boogie funk, and massive roiling bass waves that has garnered support from the likes of Pitchfork, FADER, FACT, BBC’s Benji B and Skream & Benga, A-Trak, Low End Theory, Snoop Dogg, Diplo, Dâm-Funk, Night Slugs, and many others. A Chicago native who developed his craft in San Francisco and currently resides in Los Angeles, Salva has been invited to perform on the world’s biggest stages. A 2011 alum of the Red Bull Music Academy, 2012 has seen Salva perform at Sonar, Coachella, Lollapalooza, Mutek Montreal, Detroit Electronic Music Festival, SXSW, The Do Over LA, Boiler Room, Low End Theory, and many others, while touring alongside Nguzunguzu, Shlohmo, Pearson Sound, and B2Bs with Machinedrum. Aside from his live performances, Salva hones his production talents as one of the cornerstones of the Friends of Friends label alongside Shlohmo, Mexicans With Guns and Groundislava. His 2011 debut full-length, ‘Complex Housing’ and ‘Yellobone’ EP both received critical acclaim (Pitchfork, FADER, FACT, and others), leading him to exclusive mixes for Mary Anne Hobbs, The FADER, and XLR8R, while being asked to remix the likes of Miguel Migs, Glitch Mob, Rainbow Arabia, Om Unit and others. Clicks & Whistles has been carving out a unique sound blending Southern Rap, Juke, and elements of Drum & Bass since their first official release in August 2010. The Charlotte based duo is comprised of professional programmer Jorge Hernandez (Hey Whore Hey) and classically trained Petey Evans (PeteyClicks). The two have a slew of notable releases including the heavily remixed “Neva Get Caught” on T&A Records, “Cranberry Goose EP” on Distal’s Atlanta based Embassy Imprint, and “Can’t Believe EP” on AC Slater’s Label – Party Like Us. Great taste and selection combined with honed production skills gives this group prowess in both quality and efficiency in the studio and has lead to some huge Dirty South and Club Anthem remixes. With a heavy touring schedule and a stack of upcoming releases, the sound of Clicks & Whistles is sure to be in your ears and coming to a city near you. Intense dance music for dancers and heads. In the last year Self Evident has released on labels B YRSLF Division (France), Lejal Globe (Estonia), Blipswitch (USA), Palms Out Sounds (USA), Subklub + Cabeza (Argentina), Car Crash Set (USA) + his own label Dipped Recordings (Canada) to name a few. Playing in a variety of styles & formats Self Evident has shared the stage with a plethora of dance music producers; dBridge (UK), DJ Mike Q (NYC), Addison Groove (UK), Dabrye (Detroit), Loxy (UK), Africa Hitech (UK), Dibiase (LA), Silkie (UK), Girl Unit + Kingdom (Night Slugs), The Bug + Warrior Queen (UK), DJG (LA), Maga Bo (Brazil), Bassnectar, Eprom, Distance (UK), Cholita Sound (Chile), Villa Diamante (Argentina), Kraddy (Glitch Mob), Skream (UK), etc. 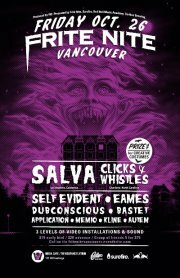 A veteran of Canadian festivals Shambhala (Nelson), Basscoast (Squamish) + Diversity (Texada Island), earlier this year Self Evident teamed up with Will Eede (Wepa! ) for a tour of Chile + Argentina. He now sets his sights on a tour of Australia + New Zealand in early 2013. A founding member of the westcoast sub|div family, Eames has spent years guiding dancefloors through the frontiers of 4/4 club music. Kevin Ehman has stood tall in the belief that melody, soul and nuance are essential elements of a good club tune. A relocation to Vancouver from Victoria/Montreal in 2011 saw him to continue to nurture his own productions, slowly unveiling new tunes via his SoundCloud page and receiving recognition from some of BC’s most notable producers (HxdB, Max Ulis, Calamalka). His smouldering house and techno bears the gritty atmosphere of a dark, secret warehouse, where the melodic surge of Chicago meets the deep throb of Detroit. Also, his collaborative record in late 2011 with Prison Garde garnered international attention and a glowing review from FACT Magazine’s Andrew Ryce. An Eames DJ set is a fluid tour of dance styles. In and around the 4/4 foundation of his sets, he weaves a myriad of influences, from Southern rap to 90’s r&b to post-everything bass music. His kinetic blends and quick mix style keep dancefloors engaged without all the pyrotechnics of so much modern dance racket. Dubconscious has come to represent both the east & the western coast of Canada. Born & raised in the Toronto area, he attended University in Victoria before spending 2 years in Nelson BC, snowboarding in the winters & working for the talent department at Shambhala Music Festival – where he has become a resident of the Living Room Beach Stage over the past 3 years. Having recently made the move to East Vancouver, this seasoned selector brings a whole new flavor to the table – heavy basslines mashed up with a roots reggae infusion, funky bashment vibes, future jams, classic hip hop & trip hop, with a dash of turntablism. Bastet’s sets are structured with inflections of mathematic rhythm, crisp dynamics and focused low end to intrigue the attentive listener and dancefloor alike. Rather than be confined by genres, her recent supporting roles include Salva, Eprom, Nero & Hot Pink Delorean in London, UK, and Vancouver’s underground community of artists including Self Evident, Tusk, Taal Mala, Max Ulis, Dubconscious, Michael Red and the Librarian. Growing up in a little BC town called Shambhala, at an early age Darby became accustomed to a status quo that, as he would find out later, was not common to the rest of the country. As the town of Shambhala grew, so did his ambitions & goals. Application has earned himself a spot in the foundation of the western Canadian underground bass music community through his heavy involvement with many of the festivals in the area, resident sound at W2, and as one of the pioneers of Integrated Grime Unit – whom Application calls home alongside a family of talented BC-based producers including ill-esha, J-me-J, Glitchy & Scratchy, Myles Away, Nog Chompa etc. Application is the product of 11 years of evolution and change. Turning his equipment into a biological appendage, he effortlessly transports you through genre and tempo, taking his audience on an emotional rollercoaster encompassing the entire human experience. Shannon Long aka DJ Memio is a Calgary-native, and for years she co-hosted the popular weekly radio show What Would The Neighbours Think? on U of C’s CJSW. A few years ago she made the move to Vancouver, and over the past year Brenda Holmes (Blenda) & Shannon have been working together as a Vancouver-based DJ team; and are proud to be called Harlatwin. Kline & Autem are two young Calgary-native, now Vancouver-based producers & DJs – Kline has been tearing up soundcloud with his subtle original productions as of late, and Autem is an up & comer with something to prove.